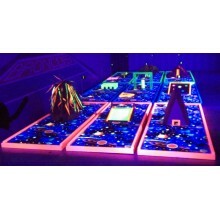 MGBLP-001 Mini Golf Blacklight Package #1 Nine holes of Miniature Golf with 9 Obstacles Dimensions of greens are 8ft long and 24in. wide playing surface. Set of nine flags with bases 18 putters in 9 youth & 9 adult sizes ..